When news of the TRAPPIST-1 system blazed across headlines, one of the common questions I got was what the planets really looked like. After all, if we can discover planets around other stars, we surely must be able to see them. But we can’t. In some ways can barely see the star. But this demonstrates how what we actually observe (and what data is important to astronomers) is very different from the common perception of what astronomers observe. The apparent sizes are accurate, but the surface features are pure fiction. Part of this misconception comes from the way we tell the story of astronomy. When articles came out talking about seven Earth-sized worlds, there were plenty of pictures of the planets as rich worlds with complex surface features. These artistic imaginings make for great images, but they are just imagined possibilities. We don’t know anything about the surface features of these planets, because we can’t even see the planets. But we don’t have to observe planets directly to know that they are there. 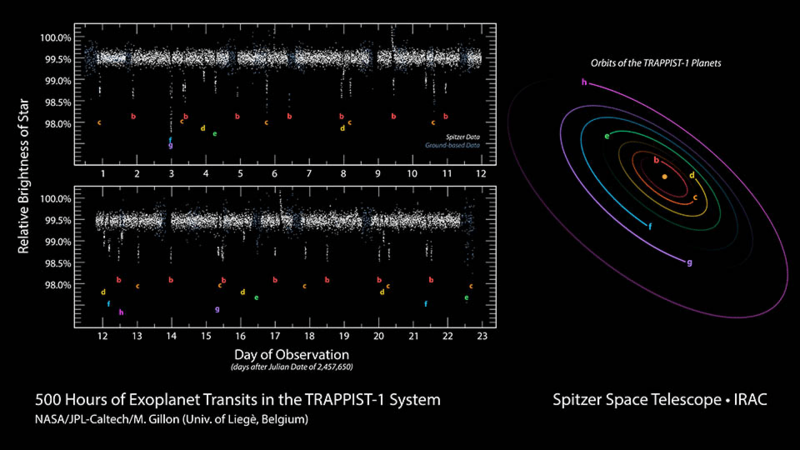 The TRAPPIST planets, like most exoplanets, were discovered using a technique known as the transit method. Basically we measure the brightness of a star over time, and watch for little dips in brightness. You can see a graph of these measurements in the image above, which shows 500 hours of data gathered from the Spitzer space telescope. Every dot on the graph is a brightness measurement. You can see how most of the time it seems to fluctuate randomly along a common average, but every now and then it dips in brightness for a bit. That dip occurs when one of the planets passes in front of the star, blocking some of the light. Animation showing the actual brightness variation of the few pixels of light from TRAPPIST-1. If you look on the vertical scale, you’ll notice that the variation in brightness is actually quite small. It only dips in brightness by about 1% when a planet passes by. 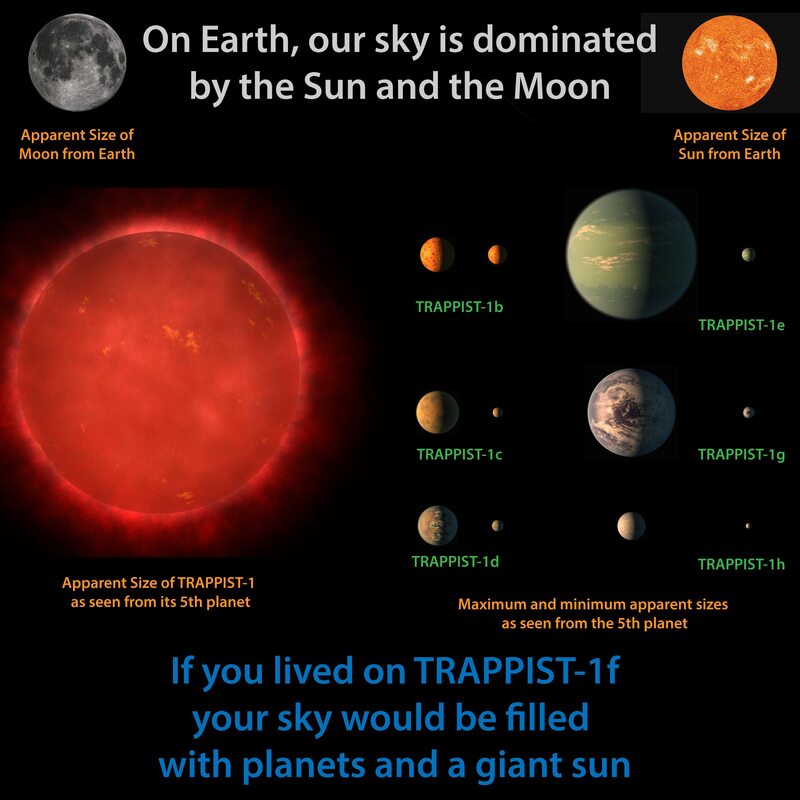 This is actually pretty large for an exoplanet, and is due to the fact that TRAPPIST-1 is a small star, only about the size of Jupiter (though 80 times more massive), so the planets block about 1% of the light. This is why we need to make sensitive measurements of a star to detect exoplanets. But even this graph is a bit misleading. We don’t just point a telescope at the star and measure “brightness.” What the telescope actually does is focus the image of a star on a digital camera detector known as a CCD. Each pixel of the detector measures the amount of light it gathers as a number, where a higher number means more light struck the pixel. TRAPPIST-1 is a small, faint, 18th-magnitude star, so even on a good telescope its light only strikes a few pixels at a time. You can see an animation of its actual image here. If you want to know what the TRAPPIST-1 system looks like from Earth, that’s it. Technically we don’t even see that. Since the CCD pixels just produce a number, what we really have are an array of numbers for each observation we make. The pixel numbers for each observation are then combined to create an overall brightness measurement. From that we analyze the dips in brightness to calculate the orbits, sizes, and masses of the planets. It’s complex work, which is what makes exoplanet discoveries so amazing. Now certain skeptics might argue that since we don’t have images of the planets, we don’t really know they exist. But that goes back to the misconception about astronomy. 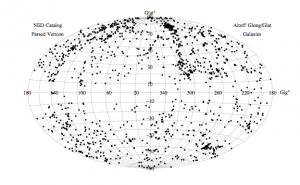 While there are lots of great astronomical images, astronomy is really about data. Even when we gather images, our focus is not about making them pretty, but about making them useful. That’s why, for example, most astronomical images are black and white rather than color, and why we observe things at a range of wavelengths to see different features. So while astronomy can discover entire solar systems, and those distant worlds would undoubtedly be wondrous to behold, that’s not what we really see. What about the bodies orbiting outside the plane of our line of sight? 99,99999% of the planes of orbits probably don’t pass by our line of sight ??? That is the limitation to the transit method. If the planet doesn’t pass our line of sight, we won’t see it. There are other ways, such as the Doppler method, to find planets, but they are more challenging. I am just getting into astronomy and this article was very enlightening. Thank you.